Updated at 1:55 p.m. with Gov. Dannel P. Malloy statement. A tax proposed by top legislators on the earnings of Yale’s sizable endowment was shot down Tuesday by the administration of Gov. Dannel P. Malloy. The proposal – backed by by Senate President Pro Tem Martin Looney and Appropriations Committee Co-chair Toni Walker, both Democrats from New Haven – generated national attention. Florida Gov. 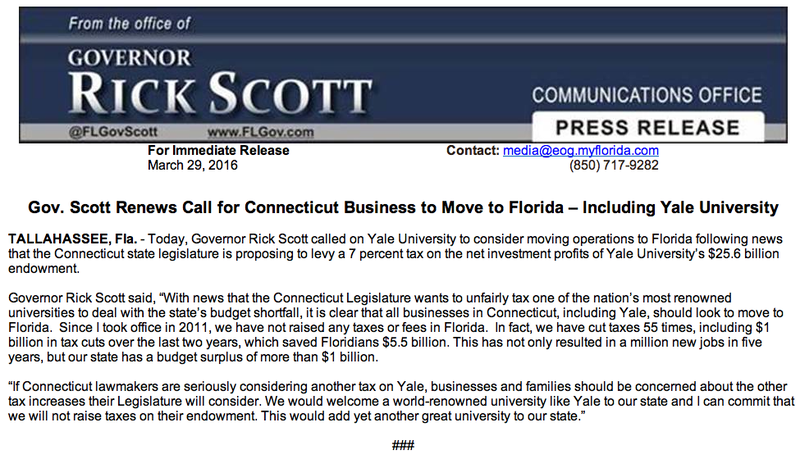 Rick Scott Tuesday pitched his state as a new home for the Ivy League school if the tax moved forward, an offer Yale quickly declined to consider. 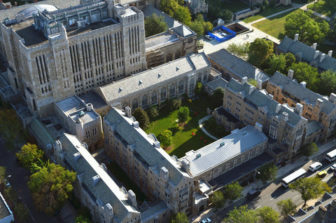 “It’s wonderful to be recognized as an outstanding asset, but Yale, New Haven, and Connecticut have been on common ground to great mutual benefit for 300 years. We’re looking forward to reaching even greater heights in education, research and civic engagement over the next three centuries and more,” said Tom Conroy, Yale’s press secretary. University officials opposed the proposed tax, which could generate millions for the state, and promised to challenge its constitutionalityin court. Read the full story about the proposal here. A screen grab of the Florida governor’s press release.